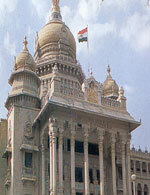 Bangalore is popularly known as the "Garden City" of India because of its climate, greenery & hygienic conditions. It is one of the fastest developing city in Asia having enormous achievement in the field of education. 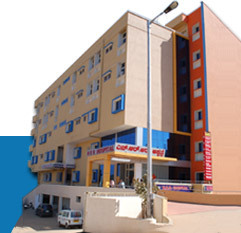 Bangalore has become one of the Best educational hub since there is ideal conditions for basic as well as higher studies. Vidhana Soudha: This magnificient building is built in "neo-dravidian" style using solid granite - the state secretatariate and the legislatures are housed inthis five storey building. Cubbon Park: This sprawiling aesthetically laid out park is across the Vidhana Soudha and covers an area of 300 acres. Conceived by Lord Cubbon in 1864, in is an oasis of tranquillity amidst the hustle and bustle of the Cosmo polis. The red gothic structure of the city's High Court against the back drop of the dream of the Cubbon Park is the riot of colours. Beside the building, the public library with its attractive rose garden, the Jawahar Bal Bhavan with its bumper attractions for the children are also located in the park. The Bal Bhavan is closed on Mondays and 2nd Tuesdays. The Lalbagh: This famous botanical garden was laid out by Hyder Ali and developed by his son Tipu Sultan. One of the towers set up by Kempegowda can be seen on a hillock here. Huge old trees with their canopy of green foliage and rare species of plants vie for attention along with the flaming red of the Gulmaohar trees. The Glass House where flower shows are held twice a year is also impressive. Lal Bagh has an attractive floral clock also. Bull Temple : Kempegowda the founder of the city is credited with the construction of this temple which has a mammoth bull carved out of a single rock. It is an example of the Dravidian style of architecture. Tipu's Palace : Built in 1791 A.D., as a summer palace by Tipu Sultan, it has an attractive wooden interior. Ulsoor Lake : The tranquil Ulsoor lake dotted with picturesque little islets is situated in the Cantonment area. It has facilities for boating. Open from 9 a.m. to 6 p.m.
Bannerghatta National Park, Nandi Hill, Hesaraghatta, Nrityagram, Shivaganga, Devarayanadurga, Ramanagaram. Janapada Loka: Is about 53 kms from Bangalore, near Ramanagaram. A subsidiary of the Karnataka Janapada Parishath, is dedicated to the preservation and promotion of folk culture, sprawling across 15 acres, the complex has an art gallery, and open-air theatre, a studio and a museum. Channapatna: 60 kms south-west, this town is famous for its lacquerware and hand-crafted wooden toys. It is also a silk centre. Dodda Alada Mara (Banyan Tree): 28 kms from Bangalore, the tree is spread over 3 acres and is 400 years old. The tree is also the largest in Karnataka. Savandurga: 61 kms from Bangalore near Magadi is yet another spot enjoyed by the trekkers. Mekedatu: 98 kms south, is a beautiful picnic spot where the river Cauvery squeezes through a narrow gorge. Muthyalamaduvu (Pearl Valley): 40 kms away is known for its verdant surroundings and beautiful water falls. This is a favourite picnic spot.